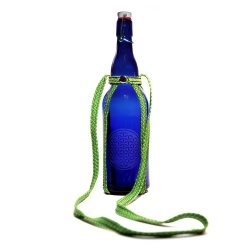 This is the Surf Recycled Glass Water Bottle With the Wide Mouth Loop Top. You can enjoy a classic glass water bottle without the concern of having it break. The silicone sleeve, with its padded Drop Shield base, has been tested to withstand damage from drops from a height of 8 feet. 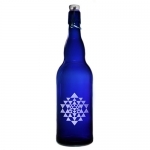 While most normally use it for water, you can also enjoy juice, iced tea or any other cold drink in this glass water bottle, while making a unique statement with the Surf’s artistic design. 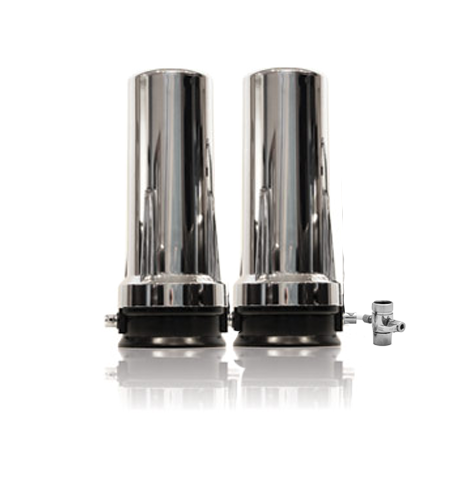 It’s good-looking, very durable, comes in several nice colors! Unlike a lot of water bottles, you can run this one through the dishwasher. 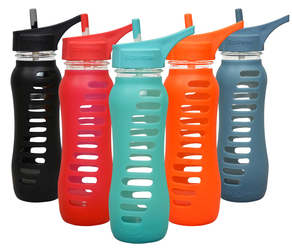 These have the loop top, for drinking directly from the smooth glass neck. Select your color from the several options. For your convenience, the openings on these bottles are wide for easy filling with ice cubes. When you buy from Friends of Water, you may return any item within 90 days for a full refund. I love these bottles! They are great! Easy to use. You unscrew the large-mouth top. So far, we have not broken the wide-mouth top.